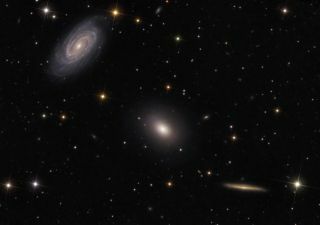 This image shows a trio of galaxies often called the Draco group because they are located in the northern constellation of Draco. The galaxy on the left is NGC 5985, the center is the elliptical galaxy NGC 5982, and the bottom right is NGC 5981. Astrophotographer Terry Hancock and former NASA scientist Fred Hermann teamed up to take this photo. The image was released June 17, 2013. A stargazing team captured spiral galaxy NGC 5985, NGC 5982 and edge-on spiral galaxy NGC 5981 in this cool night sky photo. Astrophotographer Terry Hancock teamed up with former NASA scientist Fred Hermann to take this photo. "This image is a good example of the different type of shapes that a galaxy can take on," Hermann told SPACE.com in an email. In this image, the left galaxy is NGC 5985, the center is the elliptical galaxy NGC 5982, and the bottom right is NGC 5981. All three galaxies are at a distance between 100 to 140 million light-years from Earth. This trio of galaxies is often called the Draco group because they are located in the northern constellation Draco, the Dragon. Editor's note: If you have an amazing skywatching photo you'd like to share for a possible story or image gallery, please send images, comments and equipment details to managing editor Tariq Malik at spacephotos@space.com.